Vascular Damage Control Techniques: What Do I Do When All Else Fails? Damage control resuscitation (DCR) refers to an ongoing, mobile process that includes, but is not limited to, early blood product transfusion in the context of a massive transfusion protocol, minimization of crystalloid fluid administration, permissive hypotension, early transfer to the site needed to arrest hemorrhage, abbreviated operative or percutaneous intervention, sustained critical care, and a return for definitive surgical care when the patient is able. 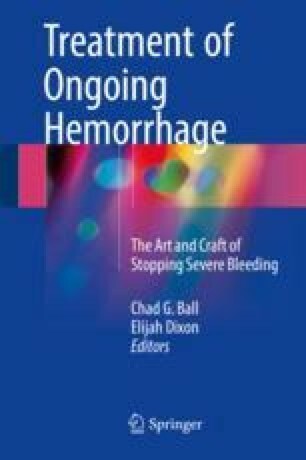 Ongoing hemorrhage in particular can be extremely challenging to manage. Damage control surgery may therefore also include the use of balloon catheter tamponade and/or placement of temporary intravascular shunts.